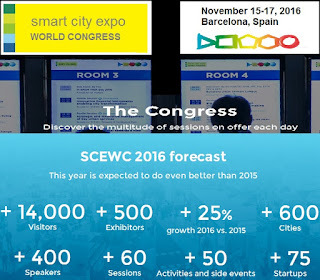 Smart City Expo World Congress(SCEWC) will take place on November 15-17, 2016, in Barcelona, Spain at the Gran Via Venue. This event will offer insightful debate, exclusive networking and experience exchange, that's driving Smart Cities forward. The are a vast array of inspirational sessions, keynotes and roundtables. Gain extensive know-how from the more than 50 cities, countries and joint pavilions striving to shape the cities of the future. 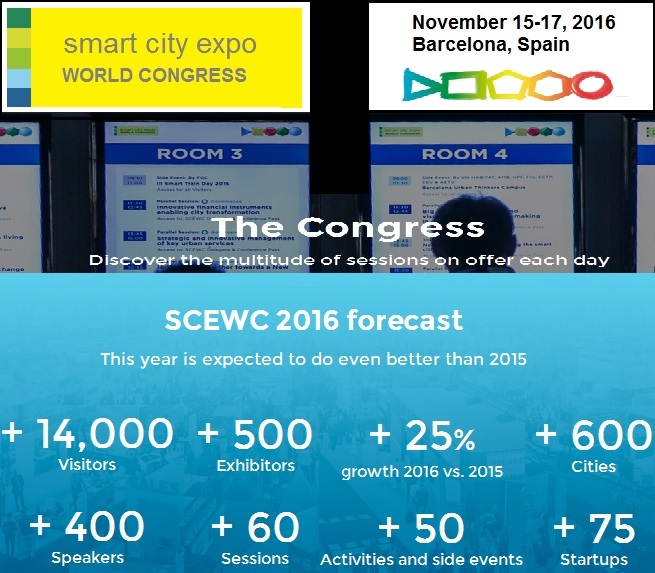 WSCEWC is the international summit of discussion about the link between urban reality and technological revolution. Since its first edition in 2011, it has succeeded to become a referential global event to support the development of our cities. The congress will bring together over 400 global influencers and innovators to share knowledge, debate the challenges faced by our cities, encourage out of the box thinking and inspire a worldwide call for action in order to develop smarter and more sustainable cities. This professional, institutional and social meeting point is a leading platform of ideas, networking, experiences and international business deals that gathers together the highest level of stakeholders, in the context of urban development. Citizen empowerment, commons, engagement, infrastructure management, open data, performance measurement, public services, right to the city, service integration, transparency. Business model, economic development, financing models, public-private- people partnership, social economy. Mobility Data management, electrical vehicles, intelligent transport systems, pedestrians, public transport, sustainable mobility, traffic management. Alternative resources, climate change, low carbon, public space, regional development, renewable energy, resilience, urban development. Data & Technology Big data, cloud, cyber platform, cybersecurity, data analysis, data protection, internet of things, networks, peer-to- peer, sensors. Public safety, cybersecurity, vulnerabilities, emergencies, data center, cloud, public services, data protection, cyber threats, infraestructures, data privacy, data management, data protection, data property, surveillance. Click here to get information on passes and prices.